I was lucky enough to have lunch with both my Little Mom and my Aunt Rose the last time I visited family in Ontario. We chatted about many things, including my favourite food memories when I was growing up, including her famous cake. I told her it is still fresh in my mind how delicious it was. My Aunt is now 92 years old and no longer bakes as she once did. I think everyone in our family at one time or another has asked her for this recipe and she was reluctant to share it just then and would always say, “one day.” Over lunch, she thrilled me by saying that she would be pleased to share the recipe with me. True to her word, she recited the recipe line by line to my sister over the phone (I had already flown back home by then). She even shared all of the little notes and tips that she had scribbled into the margins of her recipe. 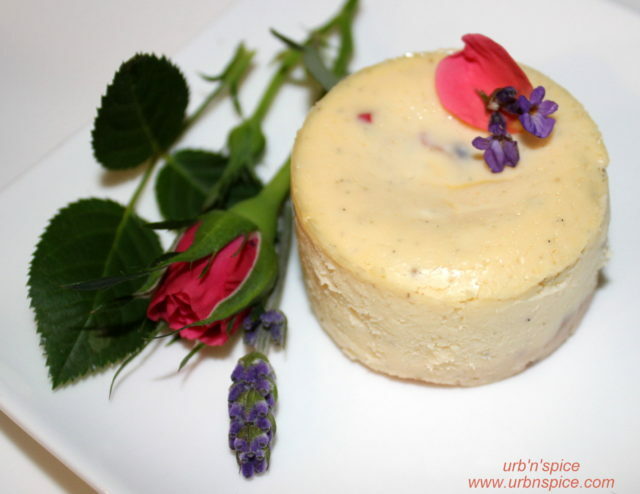 In honour of this lovely woman and her treasured recipe that she generously shared with me, I named this cheesecake – Lavender Rose. It is a pretty little cheesecake, just like my Aunt Rose. CHEF TALK: This cake is unique and decadent; therefore, I like to make tiny cheesecakes for this recipe. For a bridal shower, I used a cheesecake tray that has 12 separate wells (each well is approximately 1 1/2 inch to 2 inches in diameter). For a wedding, I use 3-inch cake rings and decorate each individually with miniature roses and lavender as shown. For these tiny cakes, I feel that a crust is not necessary. If I am making 3-inch cakes, I like to make a simple rice flour dough because the finished crust stays very light in colour. With a cake this delicate, I feel that a graham crumb crust would be a little too coarse. One thing to keep in mind when using lavender is to resist the urge to use more – a light hand is needed when using this aromatic herb – you want to leave a whisper of intrigue and mystery with your first bite. Too much can impart a soapy taste. Preheat the oven to 350oF for a conventional oven, or 325oF for a Convection oven. Prepare the pan that you choose to use by spraying with pan spray. I sometimes use a small piece of parchment in the bottom of the pan. Set aside. Using a mixer on low to medium speed with a paddle attachment, soften the cream cheese and icing sugar until very smooth. Scrape the mixer bowl several times in between to ensure that there are no lumps in the cheese mixture. With the mixer on low speed, add the egg, vanilla bean paste and rose water essence. Mix until very smooth. CHEF TIP: Strain the custard through a fine-meshed strainer. This ensures a very smooth custard after baking. Using a spatula, add the lavender buds and the rose petal. Gently incorporate these into the custard. Divide evenly into the prepared pan. Bake in the preheated oven until the cheesecakes are just set. (For the mini 2 “ diameter cheesecakes, they will take approximately 12 minutes; the 3-inch cakes will take approximately 20 minutes). The cheesecakes will become firm after chilling. Remove from the oven and let the cakes cool on a rack until they are room temperature. Chill thoroughly. Remove the cheesecakes from their pans/wells. Plate and decorate. For another lovely variation, use organic rose petals and candied violets. Straining: Strain the custard through a fine-meshed strainer. This ensures a very smooth custard after baking. Scraping: The Frequent scraping of the mixing bowl when making cheesecakes is essential to incorporating all of the ingredients into a smooth cheesecake custard without lumps. Mixing/Creaming: For all cheesecakes, it is best to mixing slowly with a paddle on low-speed to cream the ingredients together without incorporating air. Incorporating too much air can cause the cheesecake to soufflé and then crack upon cooling. Slow and gentle patience wins the race every time with cheesecakes. 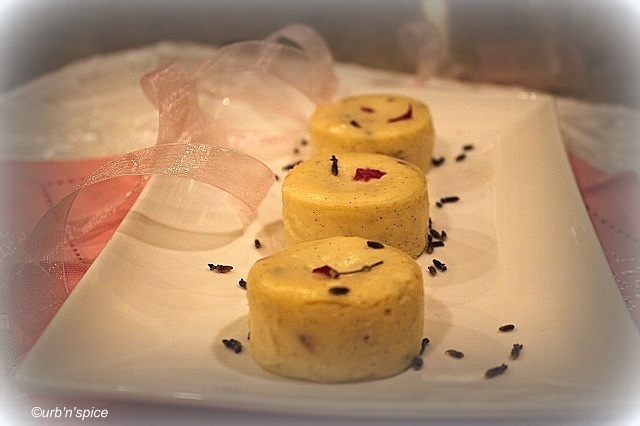 As always, if you give this recipe for Lavender-Rose Mini Cheesecakes a try, please come back and leave me a comment below with your feedback. You can find me on social media – just be sure to tag @urbnspice and #urbnspice so I’m sure to see it. Enjoy!